The auction process shall be subject to our General Auction Terms and Conditions. These terms form an integral part of the resulting contracts. The General Auction Terms and Conditions are listed hereinafter and are also displayed in the auction room. Both by taking part in the auction and by submitting bids, you agree to accept the General Auction Terms and Conditions. 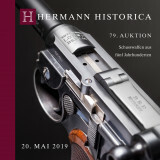 Hermann Historica GmbH (hereinafter referred to as the Auctioneer) shall carry out the auction as an intermediary in the name of and for the account of third parties, as a commission agent in its own name and on behalf of consignors, or in its own name and for its own account. The auctions may be conducted on or outside the business premises of Hermann Historica, either online, over the telephone or by using any other digital or electronic media, in particular dedicated electronic auctioning platforms. The catalogue descriptions and any verbal statements neither constitute nor contain guarantees of any specific characteristics. All objects coming up for auction are offered as used. The lots may be viewed and examined prior to the auction. All lots are sold “as seen”, without any guarantee or liability in respect of visible or hidden defects. Once the bid has been accepted, no complaints of any kind may be taken into account. The Auctioneer undertakes to carry out all purchase orders, whether submitted in writing, over the telephone, by email, fax or via the electronic auctioning platform, conscientiously but without assuming liability. The Auctioneer reserves the right to decline or disregard order bids, without giving a reason. A maximum bid must be indicated when submitting an offer in writing; however, the Auctioneer will only draw on this in the amount required to outbid other prospective buyers by one increment (approximately 5%). Identical bids will be decided by drawing lots. Telephone bidders will be contacted before their requested lot is called if a written order corresponding to at least the starting price of the object has been received in good time. Telephone bidding will only be permitted in exceptional cases for objects with a reserve of less than €1,000. No liability may be accepted for transmission errors or for difficulties with the telephone connection. If auctions are executed via the electronic auctioning platform only, bids are submitted by clicking the “Bid” button in the auctioning platform, thus submitting the suggested amount required to outbid the previous high bid. The Auctioneer rules out any liability for consequential damage or loss of profit in the event the purchase order is not concluded, provided this was not caused by wilful misconduct on the part of an employee of the Auctioneer. The Auctioneer may refuse to accept any bids in which neither the object nor the amount of the bid can be clearly identified beyond doubt. The Auctioneer reserves the right to combine, separate, exclude, withdraw or rearrange any lot without giving a reason. The sale is concluded if no higher bid is submitted after a bid has been announced three times. The Auctioneer is entitled to accept the sale under reserve. If a bid is accepted conditionally, the bidder shall be bound by his bid for four weeks. If the bidder is not awarded the sale without reserve within this period, the bid expires. A written invoice sent to the address provided by the buyer shall be regarded as confirmation of the acceptance of the bid. Conditionally accepted bids expire without notification or further consultation with the reserve bidder. Without giving any reason, the Auctioneer may refuse any bid submitted either in person or in writing, if said bidder is unknown to him, has not provided a sufficient deposit or satisfactory references prior to the auction. Likewise, the aforementioned right of refusal also applies to customers whose accounts have not been settled in full at the time of the auction. In the event a bid is refused, the second highest bid shall be binding. If several people offer identical bids and, after the third time of asking, no higher bid is forthcoming, a draw shall decide the successful bidder. The Auctioneer is authorised to retract his acceptance of the bid and award the lot immediately in favour of a particular bidder at his discretion or to offer the object again if a higher bid made at the right time was erroneously overlooked or if any doubts arise regarding the sale. If the highest bidder wishes to withdraw his bid, the Auctioneer is entitled to accept his bid nevertheless with all consequent rights; however, he may also accept the second highest bid offered or repeat the whole call. At the bidders’ request, any lot that initially remained unsold may be offered again and sold during the day of the auction, or may be transferred into a subsequent online-only auction. The successful bidder is obligated to pay the purchase price to the Auctioneer. The Auctioneer is authorised by the consignor to assert his rights arising from the sale. Prospective buyers submit bids in their own name and for their own account. The purchase price comprises the bid amount, a 25% premium thereof and the costs of insurance, packaging and shipping, if the Auctioneer is commissioned to ship the lots. If the Auctioneer is acting as an intermediary, both the premium and the fees for insurance, packaging and shipping include statutory VAT. The amount of the hammer price shall be determined on the basis of the auction record. The purchase price is due as soon as the bid is accepted and is payable in cash and in Euro. The Auctioneer expressly refers to his duty of identification according to the Geldwäschegesetz (Money Laundering Act). For credit transfers or payment by cheque on account of performance, the debt shall only be deemed to be settled when the purchase price has been credited irrevocably and in full to the Auctioneer’s account. Moreover, foreign notes and coins or currencies will only be accepted according to the respective value amount that is finally credited to the Auctioneer’s account by the bank. Shortfalls will be payable, including any fees for cheques or banking charges incurred. Please check our respective fees for payments by credit card. If a bidder acts as an agent for a third party, both may be held personally liable for obligations arising from the contract. This also applies if the invoice is issued in the name of another customer. The Auctioneer shall be exempt therefrom. Invoices issued during or immediately after the auction are subject to confirmation and may subsequently require correction. Any discrepancies in the amount shall be payable. Should the buyer fail to fulfil his payment obligations within the specified time limit, he is automatically in default. As a consequence, a minimum charge of €25 will be added to the invoice amount, along with any payment reminder and/or collection fees incurred. At the same time, interest shall accrue at 5% above the base rate p.a. Should the buyer fail to meet his payment obligations, despite receiving a reminder, he shall be liable for the damage caused by his default. If the Auctioneer asserts his right to compensation for non-performance under section 326 BGB (German Civil Code), he is entitled to offer the item for auction again at a later date. Once another buyer is found, all rights granted to the previous buyer shall expire. If the lot is resold, the previous buyer shall be regarded as the consignor and is therefore liable to recompense the Auctioneer’s services; fees to the amount of 20% (incl. VAT) for lots with a hammer price of €300 and above, or 30% (incl. VAT) for lots with a hammer price under €300, as well as all additional costs incurred by the renewed sale of the item thus become payable. He shall have no claim to the excess proceeds. The proceeds from the new auction are to be offset against the debt of compensation on receipt of the payment or the credit by the Auctioneer in accordance with section 367 BGB. Moreover, the Auctioneer reserves the right to rescind the contract if the buyer fails to pay the purchase price in full and/or collect his purchases within a reasonable time period set by the Auctioneer. In the event of rescission, the Auctioneer is entitled to demand compensation from the buyer for non-performance. In particular, the claim for compensation includes the commission charges incurred. The Auctioneer is entitled to claim 45% of the hammer price as flat-rate compensation without further verification. Furthermore, the Auctioneer shall be permitted to provide proof of additional damages, particularly where these are higher than the flat-rate compensation. All lots sold must be collected on the same day. Lots purchased through the electronic auctioning platform will be shipped once payment (incl. shipping charges, fees and insurance) has been received in full; upon request and agreement items can be collected from our warehouse. All risks pertaining to the item (e.g. damage) are transferred to the buyer on acceptance of his bid. As a matter of principle, the auctioned goods may only be delivered on payment of the purchase price. Nevertheless, should an item be released prior to payment of the purchase price, the transfer of ownership shall be subject to the condition precedent of payment of the purchase price in full to the Auctioneer. Under no circumstances is the buyer entitled to resell or alter the objects in any way. If the purchased items are not collected, the Auctioneer is entitled at his discretion to store the auctioned objects at his business premises or at the premises of a third party or to ship them to the buyer, including by cash on delivery. In case of storage at the Auctioneer’s premises, the items shall be stored at the buyer’s own expense and risk from the time his bid is accepted. Storage fees are charged at 0.7% of the total purchase price incl. VAT per calendar month or part thereof. Any third-party storage shall be in the name, at the expense and risk of the buyer. Storage of firearms requiring official authorisation, which are subject to a special duty of safekeeping, is charged as a lump sum of €10 per weapon per month. In cases where the buyer is located abroad and import permits are required, storage fees will only be charged from the end of the third month after completion of the sale. If sold lots are not collected within a period of 12 months, two collection reminders notwithstanding, the Auctioneer reserves the right to offer these objects for auction once again at the expense and risk of the buyer. In this case, the buyer is regarded as a consignor. Consignment fees, interest, storage costs and other expenses shall be deducted from the proceeds of the auction. Shipping shall be effected at the buyer’s risk and expense. At the buyer’s expense, the Auctioneer shall insure the objects for shipment against the usual transport risks. The buyer undertakes to report any discernible damage to the packaging to both the forwarding agent and the Auctioneer without delay. Defects that only become apparent on unpacking the goods must also be reported to the forwarding agent and the Auctioneer without delay, no later than one week after delivery. No liability will be accepted for defects in case of non-compliance with this requirement. The bidder shall bear any loss or damage resulting from transmission failures, misunderstandings or errors in telephone, telegraphic, wireless, fax and electronic communications with buyers, provided said damage was not caused by wilful or gross negligence on the part of the Auctioneer or his agents. The Auctioneer reserves the right to exclude any person from the auction without explanation, particularly those who engage in dealing or exchange during the auction, disturb the proceedings or whose accounts have not been settled in full. This is also applicable to the registration required for participation in online auctions. The above conditions also apply mutatis mutandis to public sales or subsequent private sales. The post-auction sale only commences at the end of the day on which the lot in question was first offered for sale. The buyer may only offset claims against the Auctioneer with liabilities in the same currency and to the extent that his claims are undisputed or have been confirmed by a court of law. The business premises of the Auctioneer shall be the place of performance for both parties if the buyer is a registered trader or a legal entity under public law or a special fund under public law or he has his place of residence outside the Federal Republic of Germany. The auction contract and all rights and obligations arising from the business relationship between the Auctioneer and the buyer shall be exclusively governed by German law. The Uniform Law on the International Sale of Goods, the Uniform Law on the Formation of Contracts for the International Sale of Goods and the CISG – United Nations Convention on Contracts for the International Sale of Goods shall be excluded. With regard to sales in his own name, the Auctioneer guarantees the accuracy of the information provided in terms of the object’s origin, age, epoch, manufacturer and materials. If, within three years from the day of the sale, this information proves to be materially incorrect, the buyer may rescind the transaction step by step, provided that the object is unaltered and still in the condition at the time of purchase. Any doubts regarding the information provided by the Auctioneer must be asserted without delay. The Auctioneer reserves the right to examine the buyer’s statement in both an internal and a third-party review, prior to acknowledging any such claims, and to reject the complaint, as appropriate. Except for such claims regarding the nature of the object, for the purpose of consumer protection, the guarantee period vis-à-vis end customers shall be 1 year from the date of purchase. The exclusive place of jurisdiction for all present and future claims arising from the business relationship with registered traders and for claims asserted by the Auctioneer by way of a dunning procedure shall be the registered office of the Auctioneer. The same place of jurisdiction applies if the buyer does not have a place of general jurisdiction in Germany, or has transferred his place of residence or habitual abode to a country other than Germany after conclusion of the contract, or his place of residence or habitual abode is unknown at the time legal proceedings are instituted. In these cases, except for the dunning procedure, the plaintiff may choose whether he wishes to institute legal proceedings before Munich Local Court or Munich Regional Court I. As long as catalogue owners, participants of the auction and bidders do not state otherwise, they guarantee that they use the catalogue and the items dating from the time of the Third Reich depicted therein only for the purpose of civil education, to avert unconstitutional movements, to promote art or science, research or teaching, the reporting about current or historical events or similar purposes (sections 86a, 86 Strafgesetzbuch, (German Criminal Code). The Auctioneer, his agents and consignors shall offer and/or deliver said items only under these conditions. The following applies to all objects sold by Hermann Historica that contain materials from protected and endangered species: the export of these goods – including ivory, tortoiseshell, crocodile skin, rhinoceros horn etc. – from the EU and their import into non-EU countries requires a permit from the regulatory authorities of both the exportation and the importation countries. Buyers intending to import any objects incorporating materials from endangered species into a country that is not a member of the European Community should check the relevant customs laws and regulations prior to bidding. On request, Hermann Historica can apply for the export/re-export document from the Bundesamt für Naturschutz (Federal Agency for Nature Conservation) in Bonn for an administration fee of €150/lot. Import permits are the sole responsibility of the buyer. Hermann Historica cannot guarantee the issuance of an export licence, which may take up to six months. As a rule of thumb, here are some examples of recent licence applications: Rhino horn - no German export permits for non-EU countries; elephant ivory: German export permits on a case-by-case basis only. US import: no commercial imports! Some exceptions may apply to non-commercial imports. The inability to export or import collectibles containing material from endangered or protected animal and plant species shall not be considered sufficient reason for bidders to withdraw from the sale. Buyers are reminded that they are responsible for inquiring about and adhering to any national import regulations prior to bidding. Objects that are classified as cultural goods under Council Regulation (EC) No. 116/2009 of December 18, 2008, require a licence to be exported from the EU. This regulation refers to a multitude of items, depending on their age and value, for example archaeological objects over 100 years old, regardless of their value. Firearms, Antique Arms & Armour, historical and military artefacts over 50 years old usually only require an export permit if they are valued at more than €50,000, more recent objects are generally not subject to any export restrictions. On request, Hermann Historica GmbH can apply for any necessary export permits for a fee of €75 per group of objects; the approval process may take up to 6 months. Orders and medals of the Federal Republic of Germany and her federal states, as well as their miniatures, ribbons, buttonhole bows and ribbon clasps, may only be sold to authorised persons according to section 14 paragraph 3 of the Gesetz über Titel, Orden und Ehrenzeichen (Law of Titles, Orders and Honours). Authorised persons include the recipients of the awards or persons in possession of a collecting licence. The collecting licence is granted by the responsible authority upon request (responsibility is regulated differently in each federal state). According to the commentary of the law, approval of a licence may only be refused by the responsible authority if there are serious grounds for doing so. By purchasing orders and medals of the Federal Republic of Germany and her federal states, the client affirms that he has been granted a collecting licence. Bids will only be accepted under these conditions. Firearms requiring a German firearm certificate may only be supplied to domestic clients on presentation of an identity card and the corresponding possession and acquisition permit. A fee of €15 per purchase order is payable for notification under the provisions of section 34 WaffG (Weapons Act). Modern firearms will only be shipped to foreign buyers on receipt of the necessary German and foreign permits. Upon request, the Auctioneer will apply for an export permit for shipments against a variable fixed fee. If any special conditions are imposed in obtaining a valid export permit, compliance with which involves additional fees and expenses, these shall be invoiced to the buyer. The sale remains legally binding, irrespective of whether the buyer holds a corresponding possession and acquisition permit. In the absence of a permit, the buyer shall be liable for his bid. Buyers domiciled abroad bear sole responsibility for observing the regulations in force at their place of residence on the acquisition and possession of weapons or war material. The Auctioneer cannot be held responsible in the event of loss. Firearms do not undergo functional testing but are sold as collector’s items in the condition described. Therefore, the Auctioneer cannot assume any liability whatsoever for their fitness for use, functional reliability or accuracy. A warranty is excluded in this respect. The Auctioneer is obligated to submit firearms without a valid proof mark to the responsible authority. In the case of valuable and/or historically significant weapons, the Auctioneer endeavours to avoid the proof mark that may be deemed mandatory by the authority and to obtain the issuance of a non-proof mark certificate. The consignor shall bear the costs hereof and for the proof mark. The Auctioneer assumes no liability for damage sustained as a result of the proofing process or on the way to and from the proof house. If one or more of the above provisions should become invalid, in full or in part, it shall be replaced by a valid provision that most closely approximates the purpose of the invalid provision. The other provisions shall remain unaffected. 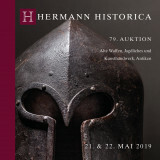 The consignor entrusts and authorizes the auctioneers Hermann Historica GmbH (hereinafter called “Hermann Historica”) to auction or sell on his behalf and at his expense the objects listed in this contract and to transfer said objects to the buyer (auction contract). The consignor becomes sole contractual partner of the sale contract originating from the auction or the freely negotiated sale with the buyer. Hermann Historica only acts as commissioner and representative of the consignor. The following conditions of consignment shall apply to the contractual relationship between the consignor and Hermann Historica. 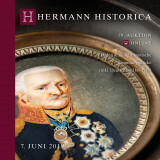 For the auction, sale and transfer of the objects to the buyer, the general auction conditions shall apply, which are published in the auction catalogue, the auction premises and on the website “www.hermann-historica.com”. On signing the auction contract, the consignor confirms that he has read the general auction conditions and accepts them. As remuneration for its services, Hermann Historica shall receive from the consignor a fee of 20% (inclusive of legal VAT). Basis of calculation is the hammer price. The fee of 30% shall apply to a hammer price of under €300. The fee is payable when the acceptance of the bid is effective. Should droit de suite charges be necessary, the consignor undertakes to pay these to Hermann Historica. By signing the auction contract, the consignor assigns the future auction proceeds in the amount of the fee to Hermann Historica, which accepts the assignment. If Hermann Historica makes advance payments to the consignor regarding the expected auction proceeds, the consignor must make them subject to interest at 3% p.a. in excess of the respective base rate as from receipt, if no other arrangements are made, until the payment of proceeds or repayment of the advance payments. On being paid the advance payment, the consignor assigns the future proceeds of the auction, including the amount of the advance payment plus interest, to Hermann Historica, which accepts the assignment. The consignor assures that he is either the sole proprietor of the objects listed in the auction contract or that he himself can freely dispose of the objects consigned by him, that the objects are free from third party rights and that he did not obtain them by illegal means. Should this assurance, however, prove to be incorrect after including the object in the auction catalogue, the consignor undertakes to pay to Hermann Historica flat-rate expenses in the amount of the premium and fee, based on the starting price of the object. Moreover, Hermann Historica can withdraw from the contract and claim compensation from the consignor if any consigned objects are found to be obtained by illegal means, particularly if stolen or prove to be counterfeit, contrary to the consignor’s assurances, or if the consignor made intentionally or negligently false statements regarding the objects in any other way. In this case, the consignor must also reimburse any auction proceeds to Hermann Historica for the buyer. The consignor takes full guarantee for his statements regarding the consigned objects, particularly regarding their condition, age, origin, authenticity and other features. The consignor therefore bears liability for possible material and/or legal defects and indemnifies Hermann Historica against any such third party claims. In case of a legal dispute, the consignor undertakes to advance legal costs including costs for required expertise. Hermann Historica reserves the right to present the descriptions and photographs of the consigned objects in the catalogue at its sole discretion. The catalogue descriptions are made to the best of our knowledge and belief, taking the consignor’s statements into account. Expertise regarding value and authenticity of the objects must be submitted by the consignor or provided at his expense. Hermann Historica is not bound to provide such expertise but is entitled to do so, on consultation with the consignor, where there is doubt concerning the authenticity of the object. The costs for obtaining such expertise shall be borne by the consignor. The liability of Hermann Historica, its employees and representatives with regard to incorrect description and evaluation shall be limited to gross negligence and intent. Unless otherwise stipulated, the starting price determined for the object by Hermann Historica is indicated in the catalogue. The object will be called at this price. The starting price is also the minimum bidding price. In the event the asking price of the consignor exceeds the estimate of Hermann Historica’s experts by more than 20% and remains unsold as a result, Hermann Historica shall be entitled to charge a flat-rate catalogue fee in the amount of €150. Lots that are included in the next auction at the starting price determined by Hermann Historica shall be exempt therefrom. At its discretion, Hermann Historica shall be entitled to sell the objects either in a live auction or an online auction. This includes the option of subsequently offering objects that are not sold in a live auction as part of an online auction. Separate terms and conditions apply to online auctions, which grant the buyer additional rights extending beyond the standard terms and conditions. Insofar as official authorization is required for the ownership or sale of the objects or if special requirements are necessary for the import to Germany or the place of auction, the consignor shall provide or fulfil these preconditions at his expense. This applies especially to compliance with the regulations of the Washington Convention on International Trade of Endangered Species (CITES) and the UN and EU regulations on cultural assets. Please refer to www.hermann-historica.com for a list of the abovementioned provisions, which make no claim to be exhaustive or currently valid. Hermann Historica has taken out transport insurance for the benefit of the consignors to cover loss and damage during shipment of the objects from the consignor to the business premises of Hermann Historica. Nonetheless, this does not imply a general acceptance of the liability risk of shipment damage on the part of Hermann Historica. Prior to each shipment, the consignor is therefore obliged to ask Hermann Historica whether the current transport insurance offers sufficient insurance coverage for the objects in question. Hermann Historica has taken out general collective point insurance against fire, lightning, explosion, water damage, burglary and robbery. 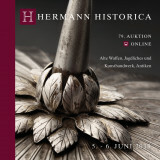 Insurance coverage commences on transfer of the objects for auction to Hermann Historica. Should the consignor wish to take out individual insurance, this must be at his own expense. Hermann Historica is obligated to submit firearms without a valid proof mark to the responsible authority. In the case of valuable and/or historically significant weapons, Hermann Historica endeavours to avoid the proof mark that may be deemed mandatory by the authority and to obtain the issuance of a non-proof mark certificate. The consignor expressly gives his consent to valid proof marks being affixed to the firearms consigned by him, should this be required by the authority. The administration fees for obtaining the proof mark (€20 per firearm) and/or issuing a non-proof mark certificate (€40 per firearm) shall be borne by the consignor. Hermann Historica reserves the right to deduct these costs from the auction proceeds payable. Hermann Historica assumes no liability for damage sustained as a result of the proof mark or on the way to and from the proof house. Where firearms are sold to non-European countries that require the exporter to mark the firearms with specific identification (e.g. the US), Hermann Historica shall also be entitled to affix such labels. Hermann Historica accepts the bid according to the general auction conditions. At the bidders’ request, any lot that remains unsold when first called may be offered again and sold during the day of the auction. A bid or sale below the starting price may only be accepted with the explicit consent of the consignor. If a bid is conditionally accepted, the consignor may only withdraw his consent to the sale in writing to Hermann Historica after two months have elapsed at the earliest. For gold and silver ware, Hermann Historica may exceptionally accept a bid below its metal value. 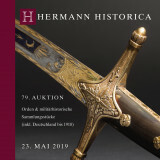 Approximately 6 weeks after the final acceptance of a bid, Hermann Historica will settle and disburse the credit balance to the consignor, however, not until the sale price has been received by Hermann Historica. Hermann Historica shall be entitled, but not obliged, in its own name to take any action necessary to fulfil the sale contract, including the legal enforcement of the consignor’s claims. All costs thereby incurred shall be borne by the consignor. The consignor is bound by this contract for up to two months after the auction day and may then withdraw from it at any time and without giving any reasons. The consignor shall leave the unsold auction objects with Hermann Historica for two months after auction day for private sale. The starting price is the minimum sale price. In the event of a private sale, the consignor must pay the same remuneration as in the case of an auction. The consignor is, however, also entitled to withdraw his order wholly or in part before expiry of the above time limit. In this case, however, the consignor must pay to Hermann Historica flat-rate expenses in the amount of the consignor’s discount (No. 2 of these conditions) and the auctioneer’s premium (No. 5 of the general auction conditions). Moreover, he must collect the objects within two weeks, failing which, they shall be returned by Hermann Historica to the consigner at the latter’s expense by means of a suitable transport company. The starting price is the calculation basis for both fee and premium. Objects that did not fetch the starting price during the auction may be offered anew in one of the following auctions at 80% of the initially arranged starting price unless the consignor objects to this procedure in writing within a period of two months after the auction has ended. The remaining consignment conditions of the first auction also apply to subsequent auctions. Should the objects again remain unsold, these regulations apply to all subsequent auctions. 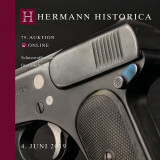 At the earliest two months after the end of an auction, Hermann Historica is also entitled to rescind the auction contract and return the unsold goods at the consigner’s own expense and risk, to store the goods until they are collected or to commission a forwarding agent with both tasks. The withdrawal must be in writing. Storage, shipment and insurance costs incurred after the withdrawal must be borne by the consignor. All unsold objects that are not to be included in a subsequent auction, withdrawn lots and objects that Hermann Historica does not wish to offer for sale must be collected by the consignor, or appropriate shipping arranged by the same at his own expense and risk, within 4 weeks from the end of the auction in which they were offered, from notification of the withdrawal by the consignor and/or notification of their return on the part of Hermann Historica. After four weeks, storage fees are charged at 0.7% of the total purchase price incl. VAT per calendar month or part thereof. If these objects are not collected despite three requests to do so, Hermann Historica reserves the right to sell them at auction to cover the storage fees incurred once the fees have accrued to 80% of the object’s last starting price. The place of performance for all services arising from the contract between the consignor and Hermann Historica is Munich. Insofar as the consignor is a merchant, a legal entity under public law or a special fund under public law, Munich shall be the place of jurisdiction for all disputes arising from the auction contract. All legal relationships between the consignor and Hermann Historica shall be governed by German law, even if the lawsuit is conducted abroad. The Law on the International Sale of Goods and the CISG – United Nations Convention on Contracts for the International Sale of Goods shall be excluded. Munich shall also be the place of jurisdiction if the consignor does not have any general place of jurisdiction within Germany on conclusion of the contract or subsequently moves his place of jurisdiction abroad. Changes and additions to the auction contract and of these conditions must be made in writing. This also applies to an amendment of this written form requirement. Should one of the above provisions become invalid, in full or in part, it shall be replaced by a valid provision that corresponds to the intent of the invalid provision as closely as possible. This shall not affect the validity of the remaining regulations.